This new game by Invisible Playground members Josa Gerhard and Sebastian Quack and Arts4City research team gives a playful twist to the Video Walk technique pioneered by artist Janett Cardiff in the late 1990s. TRIANGULATIONS. LIFE MAP invites participants to explore real and imagined spaces of the Red Triangle – a post-industrial area in the heart of St. Petersburg. Players begin by assembling a Triangulation Drone for their team – a spacecraft for 3-5 passengers consisting of a customizable body, a video cockpit, propellers and the Subwoofer Time Travel Engine. The drones are then loaded with sound and video material that precisely guides players, physically leading them on surprising paths further and further into a semi-imagined landscape. During each Triangulation Flight, players try to keep their bodies, the pre-recorded video in the cockpit and the landscape aligned. 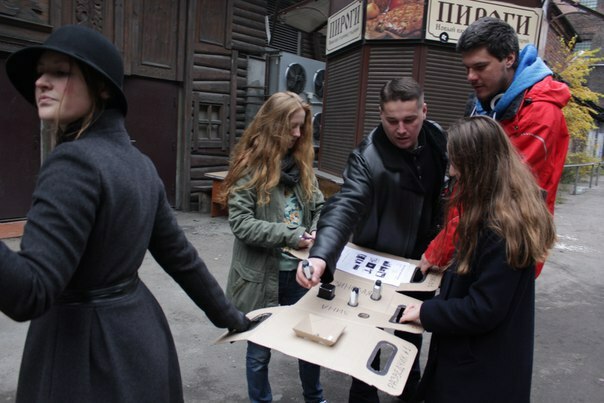 After three successful flights, teams learn how to create completely new Triangulation Flights for the other teams – resulting in an expanding collection of possible missions and encounters, a joyful and surreal performance in the atmospheric, contested urban space of Red Triangle. TRIANGULATIONS. LIFE MAP is based on in-depth research of the Red Triangle area – incorporating mental maps, video interviews and live encounters with residents into the gameplay, resulting in a fun, thoughtful portrait of people and places of a neighbourhood in transformation.